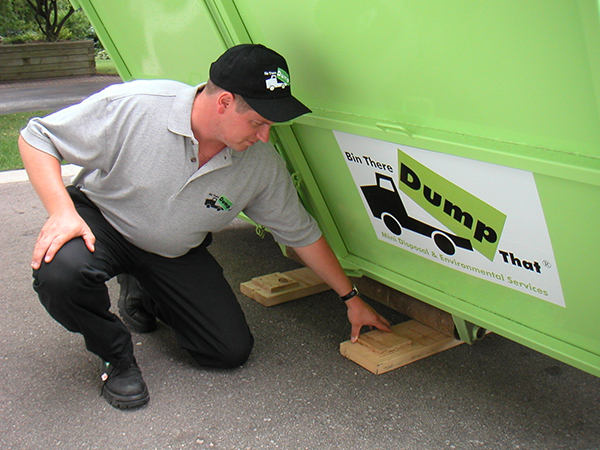 When you rent from Bin There Dump That in Wheeling, we give you up-front pricing. There are no hidden fees or charges. We provide 7-10 days of rental for your dumpster, which should allow you ample time to finish your project. The cost also covers 1 to 3 tons of material weight (depending on the size of the bin). This up-front, inclusive pricing ensures that there are no unpleasant surprises when you have finished with your rental. You can put your dumpster rental anywhere but we must inform you that if you plan to put your dumpster rental on the street, some municipalities require a permit which may incur an extra fee. However, if you plan to leave it on your driveway, then no permit is needed. We encourage you to put it on your driveway because Bin There Dump That’s dumpsters are made to be residential friendly. We pride in the appearance of our dumpsters and the service we provide in order to keep the appearance of your lot just as good as it was before we were there, or even better. Call one of our Dumpster Consultants to find out more about what we offer here at Bin There Dump That. Pricing for a 20 yard dumpster in Wheeling will vary depending on the supplier you are calling, but you should expect to pay around $400-$450 for a twenty yard container. You'll certainly want to ask if the pricing provided to you is up-front and inclusive like that provided by Bin There Dump That. Be aware that if you are given a price that seems too good to be true, it probably is! Other companies may not tell you of additional fees that aren’t included in that pricing, such as drive time, weight of materials, or cost of fuel. This can lead to an expensive surprise at the end of your seemingly cheap dumpster rental. In Frederick MD , museums meet martini bars, scenic landscapes provide thrill seekers with adventure, and cutting edge cuisine is served up in Civil War-era buildings alongside unique specialty shops, galleries, museums, and theaters. Located less than one hour from Washington, D.C., Baltimore, and Gettysburg, the city of Frederick, Maryland is surrounded by mountain views, wineries, orchards and vibrant Main Street communities. Visitors can hike the Appalachian Trail, visit Maryland's largest brewery, and tour a battlefield all in one day. This park is on a Civil War battleground site fought on July 9, 1864. This park offers a visitor center, hiking trails and also hosts special events to commemorate our history. A very nice scenic mountain spot that offers many trails for hiking, bicycling and horses. It also offers camping sites for a new kind of adventure and picnic sites for a full family day of fun and adventure. The museum of the Civil War exhibits and documents the medicinal treatment of the wounded soldiers. They have life-sized dioramas that give an opportunity for everybody to learn about our history. This museum is a miniature-world attraction for families. This world includes a volcano, zoo and circus and working trains that go through the miniature world. Your local Dumpster Rental Frederick dumpster rental operator is Richard Ferragut.